Ḥakam of the Beni-Israel community of Bombay; born at Cochin at the end of the eighteenth century; died at Bombay April 17, 1856. While on a voyage from Cochin to Bombay with his maternal grandfather, Meyer Serfadi, about 1836, he was wrecked and found by Jacob Aaron Sanker, a Beni-Israel soldier, who secured for him employment as a bookbinder. 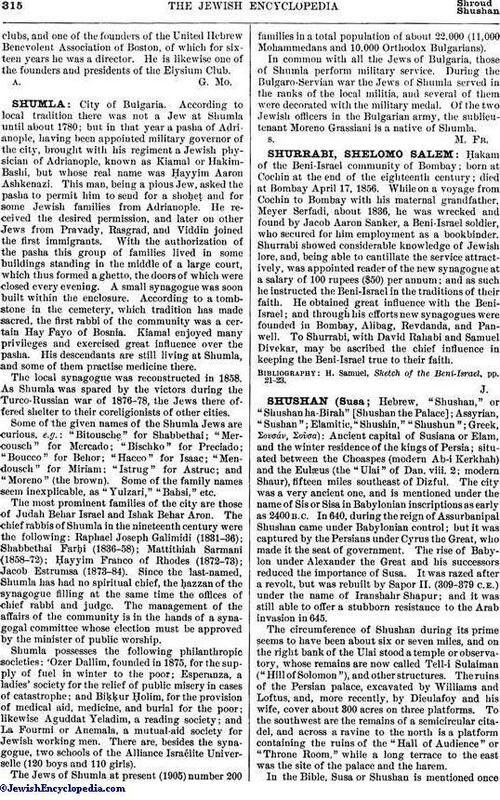 Shurrabi showed considerable knowledge of Jewish lore, and, being able to cantillate the service attractively, was appointed reader of the new synagogue at a salary of 100 rupees, ($50) per annum; and as such he instructed the Beni-Israel in the traditions of their faith. He obtained great influence with the Beni-Israel; and through his efforts new synagogues were founded in Bombay, Alibag, Revdanda, and Panwell. To Shurrabi, with David Rahabi and Samuel Divekar, may be ascribed the chief influence in keeping the Beni-Israel true to their faith.